Flavius Valentinianus was born in Pannonia about 321 AD. Valentian was the son of Gratianus the Elder. His father was a man of humble origin who rose through the ranks of the military to become a great general. Valentinian traveled along with his father to Africa where he himself began to rise through the ranks of the military. Valentinian quickly proved himself quite talented and served distinguishably under the EmperorConstantius II and later under the Emperor Julian II. However, because of his Christian beliefs, Julian dismissed Valentinian from military service and banished him to Egypt in 362 AD. Valentinian was recalled to service by the Emperor Jovian in 363 AD and was given the command of the troops in Gaul. Upon the untimely death of Jovian, the generals once again conferred among themselves to select a successor. Valentinian proved to be their choice. At Nicaea, Valentinian was proclaimed Emperor. About a month later, he named his younger brother, Valens, co-Emperor. The Empire was then divided between the two rulers, Valentinian being content to leave the government of the Eastern provinces to his brother, while he himself took charge of the Western provinces. This division of the Empire would establish a precedent that would ultimately divide the Empire in two forever. Valentinian almost immediately began building the defense of the Rhine frontier. This major project consumed most of his time. In 367 AD, Britain was simply overrun by Picts, Seats, Franks and Saxons. 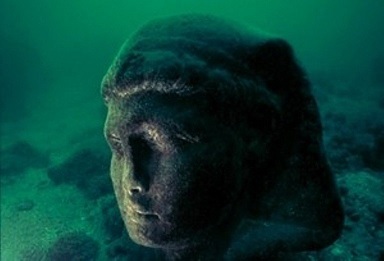 The situation became so critical that it took Count Theodosius, a skilled and experienced general, nearly two years to restore law and order in the island province. There were many reforms that Valentinian brought to government, most of which focused perhaps too much on the military. Soldiers were given almost special status and taxes were raised by almost any methods possible to insure revenues. Less refined military men were raised to the rank of Senator and the Senate itself complained about the diminishing role which they played within government itself. That event sent the empire into crisis and necessitated the biggest tax increase in Roman history up to that point in history. To pay for the disaster and the rising costs of the military efforts required during his time in reconstruction and defense, Valentinian saw himself forced to introduce the highest, and most oppressive Roman taxes in history. He was keenly aware how bad this was and raised the taxes reluctantly. He then made a interesting sincere effort to protect the poor. In an attempt to share the financial burdens more justly he made great efforts to ensure that the privileged few would no longer avoid paying their taxes. He also created the office of ‘Defender of the People’, the role of which was to assist the poor. In every town such a Defender was appointed, empowered to protect the interests of the poor from infringements by the privileged classes and to ensure they were not bankrupted by the taxes. Here we have a weight (exaqium) for measuring gold solidi for taxes. 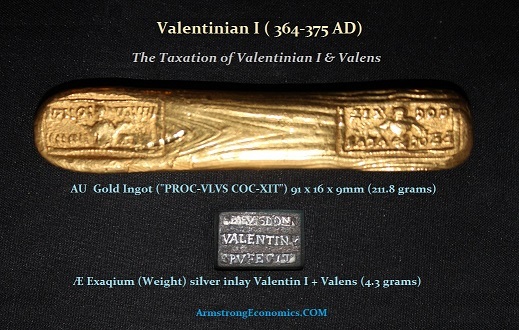 Because of the large number of under-weight and false solidi in circulation, financial reforms were instituted by Valentinian I and Valens whereby gold collected in taxation was to be melted into ingots and tested before acceptance. Coins ceased to be legal tender (acceptable for taxation). The few gold ingots that have survived from antiquity are found with official counterstamps and the present example illustrated here bears the inscription “melted by Proculus”. During the tax collection of 366 – 367AD, Valentinian I thus imposed taxes due not in coin but instead by weight. The government essentially refused to accept its own deflated currency which might be under the official stated weight of 4.3 grams for a solidi as illustrated above in the exaquim and instead required all tax collections to be melted according to fineness and weight. Everything was melted down and poured into ingots such as the one offered here. The inscription on this ingot reads “melted by Proculus” weighing in at 211.8 grams measuring 91 x 16 x 9 mm. This bar represented 47 gold solidii at an official weight of 4.3 grams each. Below, another bar has survived with a weight of 337.23 grams showing an image of the three emperors – Valentinian I, Valens and Gratian. Most of his reign was spent fighting what appeared to be endless attacks on the borders by barbarians. Finally, in late 375 AD, while in residence at Bregetia, in Pannonia, Valentinian granted an audience to a delegation of Quadi. He became so enraged at their impudence and lack of respect, that the Emperor was seized with an epileptic fit and died on November 17th, 375 AD. For all his faults, Valentinian did in fact revitalize the Roman Army at a time when it was desperately needed. His changes to the bureaucracy were also an important governmental reform. He also left behind a very competent son – Gratian, who had been named after his father. The Largest Silver Multiple Presentation Piece of 24 Miliaresia (48 Siliquae) 104.3 g. 66 mm., minted at Antioch, 369AD. Diademed, cuirassed and draped bust right of Valentinian. Reverse: Legend in four lines within laurel wreath; below, “AN” (mintmark for Antioch). Unpublished, and apparently unique; cf. Kent, RIC X, p. 139 discussing the Priscus Attalus medallion of quarter-pound weight. Some light porosity and displaying stray marks. Minimal wear results in the net grade of Extremely Fine. . This silver multiple weighing one-third of a Roman pound of silver is remarkably thick in comparison to contemporary silver coins. 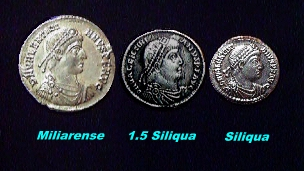 At the time, the normal silver unit of account was the siliqua and 24 siliquae equaled a gold solidus. The siliqua, the silver miliarense (2 siliqua) and the gold solidus were introduced during the monetary reforms of Constantine the Great. During Constantine’s reign, gold was valued at about 14 times the worth of an equal weight of silver. 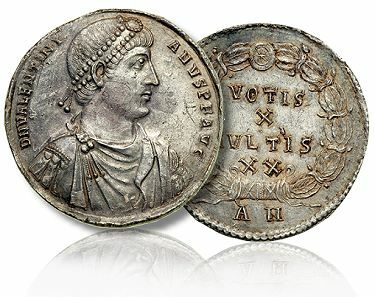 Modern numismatists use the terms “siliqua” and “miliarense”as denomination names; however, they have no basis in fact as having been used in ancient times to refer to a specific coin. This coin was no doubt a presentation piece given to a high-ranking Roman officer or dignitary. One theory that has been advanced is the possibility that Count Theodosius himself, peacemaker of Britain at the time, was the recipient of the medallion. A likely occasion for this honor was Valentinian’s quinquennial celebration, held on 25 February AD 369.